Question-1 :- Which of the following statements are true and which are false? Give reasons for your answers. (i) Only one line can pass through a single point. (v) In Fig., if AB = PQ and PQ = XY, then AB = XY. (i) False. Since through a single point, infinite number of lines can pass. through a single point P.
distinct points P and Q. (iv)True. If two circles are equal, then their centre and circumference will coincide and hence, the radii will also be equal. (v) True. It is given that AB and XY are two terminated lines and both are equal to a third line PQ. Euclid’s first axiom states that things which are equal to the same thing are equal to one another. Therefore, the lines AB and XY will be equal to each other. Question-2 :- Give a definition for each of the following terms. Are there other terms that need to be defined first? What are they, and how might you define them? (i) If the perpendicular distance between two lines is always constant, then these are called parallel lines. In other words, the lines which never intersect each other are called parallel lines. To define parallel lines, we must know about point, lines, and distance between the lines and the point of intersection. 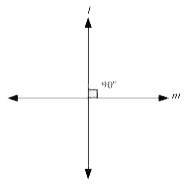 (ii) If two lines intersect each other at 90 degree, then these are called perpendicular lines. We are required to define line and the angle before defining perpendicular lines. (iii) A straight line drawn from any point to any other point is called as line segment. To define a line segment, we must know about point and line segment. 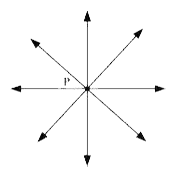 (iv) It is the distance between the centres of a circle to any point lying on the circle. To define the radius of a circle, we must know about point and circle. To define square, we must know about quadrilateral, side and angle. There are various undefined terms in the given postulates. The given postulates are consistent because they refer to two different situations. Also, it is impossible to deduce any statement that contradicts any well known axiom and postulate. These postulates do not follow from Euclid’s postulates. They follow from the axiom, “Given two distinct points, there is a unique line that passes through them”. Question-4 :- If a point C lies between two points A and B such that AC = BC, then prove that AC = AB/2. Explain by drawing the figure. Here, (BC + AC) coincides with AB. It is known that things which coincide with one another are equal to one another. It is also known that things which are equal to the same thing are equal to one another. Question-5 :- In Question 4, point C is called a mid-point of line segment AB. Prove that every line segment has one and only one mid-point. Let there be two mid-points, C and D.
Here, (BC + AC) coincides with AB. It is known that things which coincide with one another are equal to one another. This is possible only when point C and D are representing a single point. Hence, our assumption is wrong and there can be only one mid-point of a given line segment. Question-6 :- In Fig., if AC = BD, then prove that AB = CD. According to Euclid’s axiom, when equals are subtracted from equals, the remainders are also equal. Axiom 5 states that the whole is greater than the part. This axiom is known as a universal truth because it holds true in any field, and not just in the field of mathematics. Let us take two cases − one in the field of mathematics, and one other than that. Let t represent a whole quantity and only a, b, c are parts of it. t = a + b + c   Clearly, t will be greater than all its parts a, b, and c.
Therefore, it is rightly said that the whole is greater than the part. Let us consider the continent Asia. Then, let us consider a country India which belongs to Asia. India is a part of Asia and it can also be observed that Asia is greater than India. That is why we can say that the whole is greater than the part. This is true for anything in any part of the world and is thus a universal truth.